C.S. Lewis’ book The Screwtape Letters contains a series of letters written by a demon to his nephew, advising him on how to go about tempting and deceiving his charges on earth. The book helps readers consider the myriad of ways in which evil forces work to keep us distracted from the truth of who God is and what He has done. Time is a unique thing. Unlike money, we can’t accumulate it or multiply it. Unlike other things we attempt to control, we can’t hold it back, slow it down, or stop it. Time continues to move forward at the same rate, every second, minute, hour, and day of our life. It’s the same for everyone; we all use up an equivalent amount of time each day. The older we get, the more the truth of this hits us. Consider the last time you saw a niece, nephew, or a friend’s child who lives far away. You were likely shocked at how much they’ve grown. Seeing them so much taller than the last time you saw them is a stark reminder of the passage of time. “O LORD, make me know my end and what is the measure of my days; let me know how fleeting I am! Behold, you have made my days a few handbreadths, and my lifetime is as nothing before you. Surely all mankind stands as a mere breath! Selah. Surely a man goes about as a shadow!” (Ps. 39:4–6). Our days on earth are numbered, and God not only knows the exact number of those days, He also determines the number. Your eyes saw my unformed substance; in your book were written, every one of them, the days that were formed for me, when as yet there was none of them (Ps. 139:16). The number of days we have on this earth were determined before we even existed. And when we compare those days with eternity, our life is but a breath. What do we do with the brief breath of time? You have here a delicate task. The assumption which you want him to go on making is so absurd that, if once it is questioned, even we cannot find a shred of argument in its defense. The man can neither make, nor retain, one moment of time; it all comes to him by pure gift; he might as well regard the sun and moon as his chattels. God is our Creator; He made all things and owns all things. Everything we are and have is a gift of His grace: our breath, health, money, food, shelter, and our time on earth. Our days belong to God, and we merely steward them for Him. We can be good stewards of our time or bad stewards. We can use it for His glory or for our own. Like the servants in Luke 19 who were given money to invest, God has given us time to invest for the kingdom. While we can’t stop, create, or multiply time, when we invest it in eternal pursuits, it pays dividends that last forever. When we start to think about time in terms of stewardship, we realize how much of our time is about us. How often are we interrupted from something and respond in irritation? How often are we asked to serve someone and we say we can’t because we “don’t have enough time”? How often do we use the time we do have in trivial things rather than in eternal things? How often do we fail to appreciate our time as a gift of God’s grace or take it for granted that it will always be there? How often do we put off having a spiritual conversation with someone, assuming they will always be around to hear it? For me, the answer to those questions is far too often. I view time as my own possession to do with as I choose. I treat other people as time thieves. I am stingy and selfish with my time, often looking forward to the end of the day when I get time all to myself to use however I want. I overlook and miss the opportunities God places in my path for me to glorify Him. 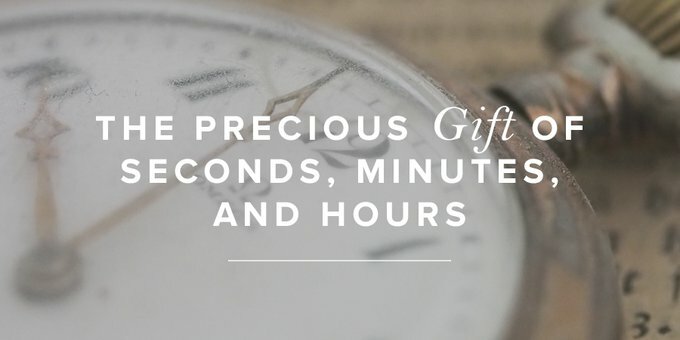 Those interruptions to completing my to-do list for the day, those requests to meet for coffee or talk on the phone, those moments when my kids want to talk, those quiet blocks of time when I could sit and spend time with the Lord—all missed because I view time as belonging to me and not to the Giver and Keeper of time. The older I get, the more I realize how precious our time is. Maybe you realize that, too. May we use our time wisely, for the Lord and His glory. May we steward well those precious few moments we have here on earth, investing it in eternal pursuits, always remembering that our time is not our own. Christina received her undergraduate degree from Covenant College and her Master’s Degree in Counseling from Palm Beach Atlantic University. She writes for a number of Christian ministries and publications including Desiring God and The Gospel Coalition. She is the editor for enCourage, a women's ministry blog of the PCA and the author of A Heart Set Free: A Journey to Hope Through the Psalms of Lament and Closer Than a Sister: How Union with Christ Helps Friendships to Flourish. She prefers her coffee black and from a French press, and she enjoys antiquing, hiking, traveling, and reading. Christina lives with her husband of twenty years and their two boys in Atlanta.